This year fingerpick your favorite Christmas songs on ukulele with your family and friends! 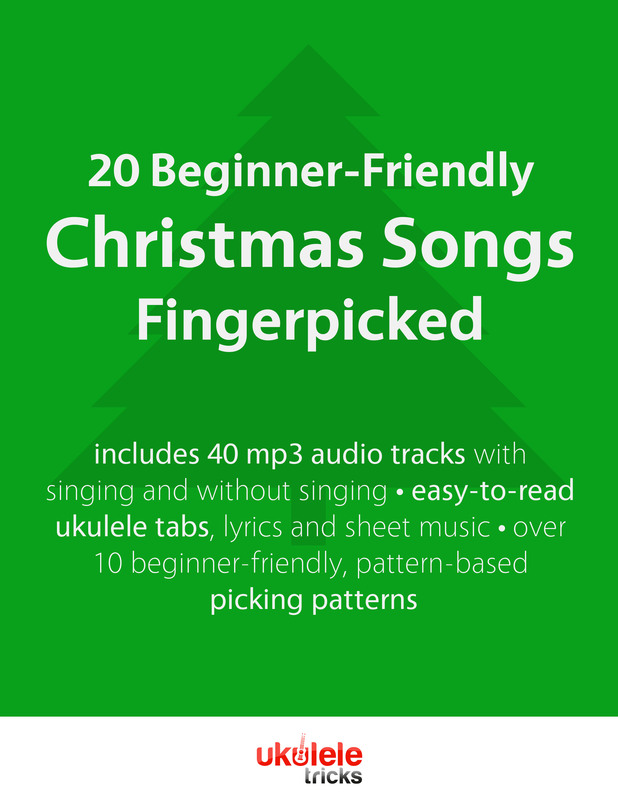 In the 20 Beginner-Friendly Christmas Songs Fingerpicked songbook, we’ve simplified and arranged these well-loved songs to be perfect for those who are new to fingerpicking the ukulele. We’ve set things up to get you playing these songs as quickly as possible. All songs are arranged in beginner-friendly ukulele keys. Many Christmas songs were originally composed and written with frequent, often difficult chord changes. In these arrangements, we simplified things to make it so a beginner can learn these songs. Not sure what picking pattern to use? Not a problem. For every song, we include a recommended picking pattern that will work for the song. There are over a dozen suggested picking patterns used throughout the songbook, meaning you are learning some new picking patterns while learning the songs. The selected patterns combine single-note patterns and simultaneously pinched fingerpicking patterns (where you pluck multiple notes at once). They are designed to be as a beginner-friendly as possible and don’t use syncopation. Note: This songbook does not teach fingerpicking technique because the Fingerpicking Tricks is dedicated to showing you how to do this. Each song comes with two MP3 audio file performances. One MP3 is a performance of the song with singing. The second MP3 is the same performance of the song but with no vocal track and a metronome keeping the beat, so you can hear exactly what should be played. Need to brush up on the ins and outs of ukulele tabs? We’ve got you covered. You get a ukulele tab reference guide so you can get the most out of the arrangements in this songbook. Once you complete your purchase, you’ll be redirected to the Ukulele Tricks Member Area where you can download the songbook and all it’s contents. No. The songbook is available for you to download in the Ukulele Tricks Member Area upon purchase. You have unlimited access to the songbook. Your membership never expires. 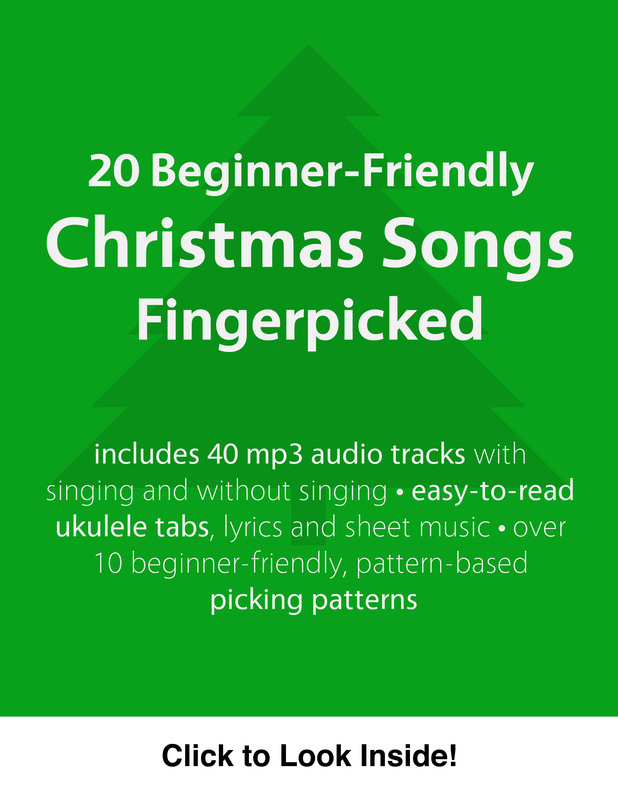 20 Beginner-Friendly Christmas Songs Strummed is not available in a physical, book format. This songbook is designed for ukulele players who have a sense for the basics. If you’ve never played the ukulele, we recommend starting with the Strumming Tricks course.